This article is being written with the intention of sharing some very good information about the work of the Guru through human hands. Such great tasks can only be established and put into place by the powers of a Guru. How silently yet powerfully the Divine and Guru work, which we were able to witness in this divine process of the consecration of the Paradalinga in the form of rituals, gatherings, puja, music, havans, prayers, meditation, offerings, chants, and so many other things, done in order to bring that power within the human reach by transforming mercury into the highest possible form of the Divine! Words cannot describe everything and so i do not wish to go too much into the happenings or wonders that happened every now and then in these three days. In fact, they can be called miracles only when it seems too overwhelming for our minds - they are nothing but the way of the Divine - the most natural way the things are. Throughout the article Amruteshwara is the Pardeshwar Linga and the Maha Meru is referred to as Amruteshwari. We were fortunate to be a part of this wonderful event of the installation and consecration of the Amruteshwara at Mysore. On the scheduled day - February 5th, 2011, we reached Mysore at the Railway Station and soon were in the van that was arranged by SMji. This van trip was planned to take us around all the holy places in and around Mysore beginning from the Suthur Math to Nanjundi Temple, Jwalamukhi Tripurasundari to Chamundeshwari Temple, Nandi Temple, Shiva Caves, Laxmi Narayan Temple and few others. By the time this scheduled visit ended it was dark and we reached at Yagneshwara/Tejeshwara Farm of SMji. It is located 35 kms from the Mysore city. Though we were travelling all day and that too after an overnight travel from home, there were no signs of exhaustion. Quickly, we were given a huge room where all of us would be together - about 18 of us. We could hear the chants coming from the top of the building and that indicated that whole day the processes were going on. We did not rest but straight away were asked to join in the functionalities. We all met each other for the first time and soon it was a family :) That late evening we all spend our time in the processes that was already going on there throughout the day. The pandits were the same pandits who had done last year the Homam or Yagna at Mysore in Babaji's presence. The whole environment looked grand with lights, plantain leaves, flowers and garlands everywhere and the divine chants of the pandits in that whole space. We then had the procession of bringing the Amruteshwari (Maha Meru), 16 merus (nityas) and four small Parada Lingas to the temple. This was brought from SMji's farmhouse which is in front of this temple. The temple is built on the top above a square building that has an open space in the middle of the building. The temple that was visible from the ground level both from outside and inside was surrounded by glass and was the place chosen to install the Amruteshwara. Right above Amruteshwara is installed Amruteshwari, which makes the enhancement of energy flow very high. The entire place around the temple has all facilities of an ashram - on the ground floor is the large dormitary spaces that can accommodate upto 200 people, the kitchen space, with washrooms on both floors. The large meditation hall is divinely cozy and warm and vibrating with peace and divine energies. Above this hall on the first floor is the temple and opposite to the temple is a large permanent space for a large homam kunda and an extension of long space for people to sit. The top floor also has space for people to have prasad (meals). i have tried to cover everything in the video in the end. After dinner we all settled down in our beds - all of us in one room, and woke up at 4 a.m. Three of us had our bath and went up and sat in front of Amruteshwara. i cannot describe how wonderful and blessed feeling it was to sit here far away from home at the divine hours of early morning in front of Amruteshwara . It was not yet consecrated but still radiated those vibrations to bring one's wandering mind to a halt. Soon, it was daylight and we had our coffee. 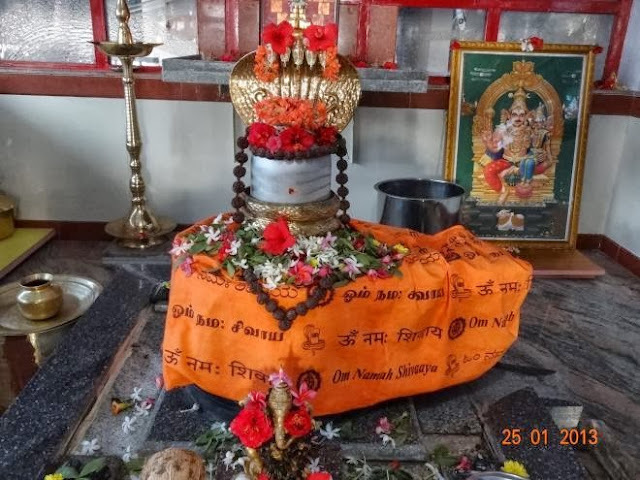 Babaji had imparted this knowledge and experience of making Amruteshwara to a fortunate blessed few, one of who was installing this Linga here in Mysore. The whole day was involved in many processes and continuous homams and a Rudra Abhishekham. SMji told us that we were also having the Dakshinamoorthy Homam with white lotuses, which is very rarely done otherwise. The whole day passed just being there in all those processes and i could sense the seriousness involved in the entire procedure. Firstly, taking 10-11 months for just the physical purification of the mercury and then this divine process of consecration. Every now and then SMji told us many things related to the entire process and the many things that happened during these months. The second day, we got some time in the afternoon to rest, but we preferred just moving around. SMji was very kind enough to arrange separate homams for every one present there in turns from 4 p.m. to 9 p.m. It was an awesome experience. Then we all had our dinner together and came back to our room. Here a few of us sat on our beddings on the floor, talking about Nityananda Baba and our Babaji and by the time we went to sleep it was 2 a.m. After two hours of sleep three of us woke up and got ready by 4:30 and went up to the temple. The energies were getting broader. This time i had experiences very difficult to explain; it was like a kind of disorientation. Then, as usual we had our tea and later breakfast and soon were ready for the final process of the consecration - the Shanti Homam and the Purna Ahuthi. This went on from morning through afternoon. Finally, we all had the pradakshina with the Kalash around the entire building and offering it to the priest back in the temple. SMji along with the main priest did the final part of the process and by 3 p.m. everything was done. SMji told that we could visit into the temple for one last time after which it would be closed. Soon we had lunch and after lunch we went into the temple. It was just a powerful place by now. Rest is unexplainable. We then all went back and packed our bags as we had to leave this evening. In an hour two vans came up and we were all leaving this beautiful place. Some stayed back and planned to leave the next day and we bid each other goodbye; we had to catch our trains this night. 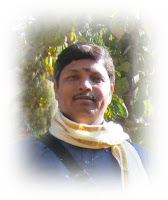 i could not thank enough Siva Moorthyji for everything that he did for us and is doing for many and that he continues to do with this noble work under the grace, instructions and blessings of Babaji. We literally pulled SMji into a group photo near the farms. 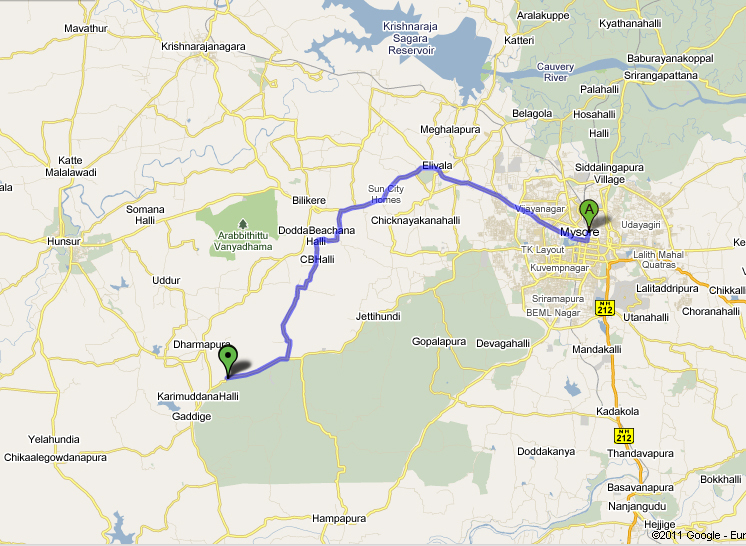 From Mysore city it is about 30 kms towards Hunsur-Gaddige Road. Bustop: Yagneshwara Farm Bus Stop (which is right in front of the gate. 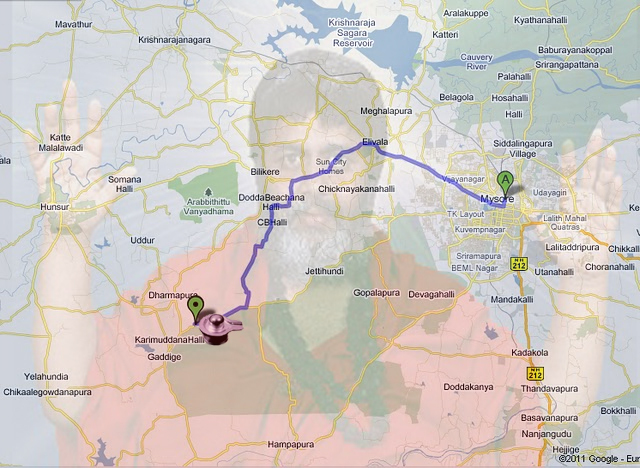 By road it takes around 45 mins to reach. Can accommodate up to: 200 people with bedding. Take your own bedsheets/blankets. Any number of sadhaks from 1 to 200 can go there to do sadhana and stay for any number of days. You will only need to contact Satishji and inform him at least a week before that that he can make necessary arrangements. In spreading the fragrance everywhere. "Om Shri Guru Avadhoothaaya Shivaandaaya Sharanam"
blessed be all.. namah shivaya..